Katie White and David Swift from DIT Students' Union pictured at yesterday's opening of the USI National Congress in Ballinasloe. THIRD-LEVEL STUDENTS from across Ireland will have opted to defer a vote on whether to abandon their national union’s stance opposing all forms of tuition fees and student contributions. 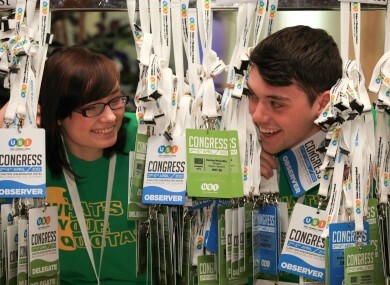 Around 300 delegates, representing most of the country’s third-level students’ unions, were due to vote at the Union of Students in Ireland’s national congress in Ballinsloe – but the matter has now been deferred to a special one-off congress later this year. Delegates were to be asked being asked to vote in a ‘preferendum’, ranking by choice their preference for the future funding models for college education, which saw tuition fees abolished for the majority of undergraduates in the mid-1990s. Students who qualify for the ‘free frees’ scheme are required to pay an annual registration fee, however, which has risen from IR£150 to €2,250 since its introduction. A number of larger students’ unions had held campuswide ballots to decide on their union’s stance; delegates from the students’ union in Trinity College, for example, have been mandated to support a student loan scheme. The four-day congress opened yesterday with complaints by outgoing USI president Gary Redmond, whose successor will be elected today, that education minister Ruairí Quinn had pulled out of a commitment to attend the congress and address delegates. USI is separately taking legal action against Quinn over changes made to the third-level grants regime last year, arguing that students who had already begun full-time tuition had a legitimate expectation that changes of such severity would not be introduced. A ruling on that case is due to be issued by the High Court on May 10. Email “Students defer vote on whether to abandon ‘free fees’ stance”. Feedback on “Students defer vote on whether to abandon ‘free fees’ stance”.